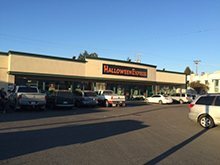 Welcome to Halloween Express of Spokane, WA! We are so excited to be bringing a fresh, new selection of spooktacular goodies to the area. Our address is 1020 W Francis, which is conveniently located right next to the Swinging Doors Restaurant, less than 1 mile from Division St! Come visit our locally owned Halloween Express store for all of your costume, prop, wig, mask, and decoration needs - you won't find a better selection (or more passionate Halloween lovers) anywhere else! We will be opening by September 10th.